Buy a discounted PF Chang’s gift card today to save money on your entire bill! That’s right, you can now enjoy casual Asian-style dining for less money than ever before! And with a menu featuring chicken, beef, pork, seafood, and vegetarian dishes, you are sure to find the perfect entree for everyone in your party. Just think of the money you will save when you use your discounted card on your next visit. Whether you stop in for a short happy hour or are looking to dine in for lunch, jor dinner, the savings are just as great. When you use your discounted card, you will pay less money for your entire bill. This means you will enjoy the same fantastic food for less! So,what do you have to lose? Whether you’re looking for the perfect restaurant for date night or just somewhere to stop in for a couple of drinks after work, this restaurant is sure to please. They offer a huge variety of delicious foods in a friendly modern setting that is sure to take your mind off work. And that’s not all. They offer a children’s menu too. Why not treat the entire family out to an Asian meal they are sure to love? And the best part is, you can purchase a PF Chang’s gift card at a discounted price and save money on your entire bill. The very same Asian style food you love, for less money. It doesn’t get much better than that! Buy your discounted PF Chang’s gift card today and save money in any of their 200+ nationwide locations. Founded in 1933, this restaurant is the go-to place for fantastic Asian style dining with flair. And now you can use your card to save money every single time you visit! This means more delicious Lettuce Wraps, Dim Sum, Pad Thai, and more, for less money out of your wallet! What’s not to love about that deal? Get your card today and save more money than ever before on the very same food you love. And don’t forget, gift cards make fantastic presents too! Surprise that special person in your life to a dining experience they are sure to love! Planning a big event? Consider using a discounted PF Chang’s gift card to save money on catering. That’s right, you can you leave the cooking to the professionals and enjoy fabulous Asian style food for less money! And the savings don’t have to stop there! Cards2Cash offers discounted gift cards for many restaurants, and retail shops. If you would like to save more money every day, be sure to check out our other great listings! We offer cards for Panda Express, Carrabba’s, Maggiano’s, Bonefish Grill, and more! With Cards2Cash, eating in the restaurants you love is finally affordable! 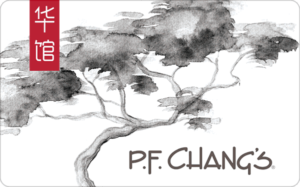 Do you have a PF Chang’s gift card you would like to sell? Cards2Cash will buy it from you! Not only do we buy gift cards to many popular restaurants and retailers, but we also pay top dollar for them! Why hold onto a card you will never use when you can turn it into money instead? For more information, stop in one of our retail locations, and we’ll pay you cash right on the spot for your card. Or just fill out our secure online form, and we’ll get back to you with an offer for your card. Either way, Cards2Cash is your one-stop stop gift card shop!